In the lower price bracket we've 4 basic car sets at £12.99. Each has the vehicle, driver and a small accessory - chequered flag, trophy, barrier, fantastic little 2 part orange cones which really work far better than they have a right to. 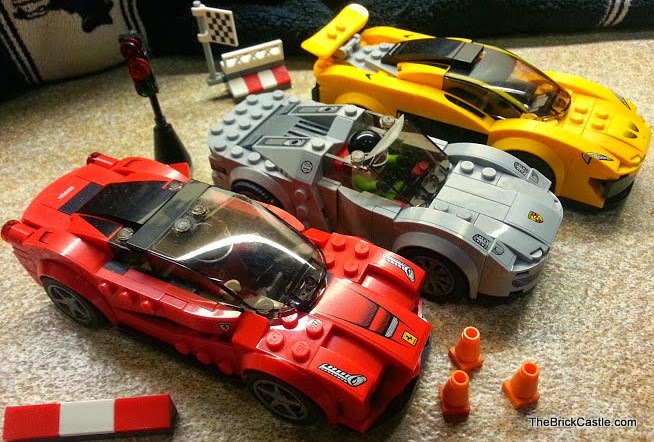 Personally we think it's excellent that LEGO have chosen to feature these big 3 Hybrid Supercars. Without the big money pumped into research by these huge companies, the technology would never become cheap enough to trickle down to the everyday user. And the 458 Italia GT2 - which we have not yet seen in person alas. 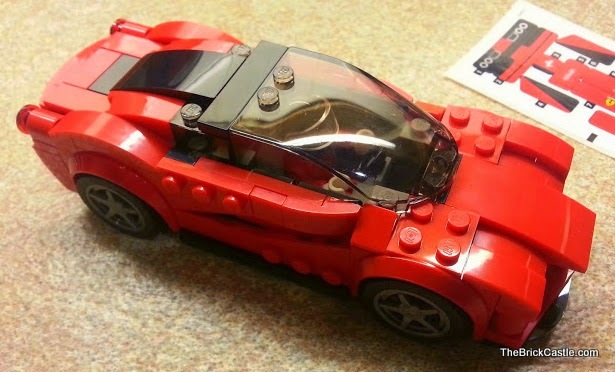 All 4 of these individual car LEGO Speed Racers sets have 151-168 elements. 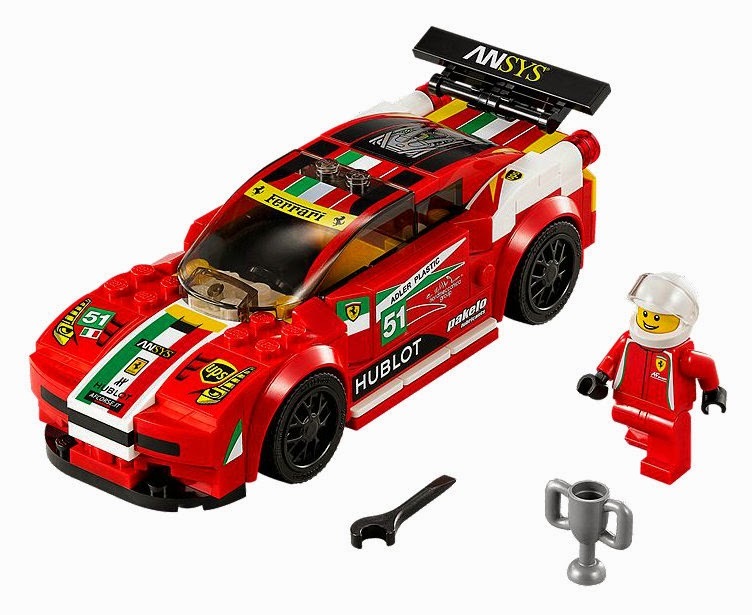 Although the pieces are small, this still represents a good value for money set, and as a licensed product, especially to such huge players as Ferrari and Porsche, I expected these sets to be much more expensive. 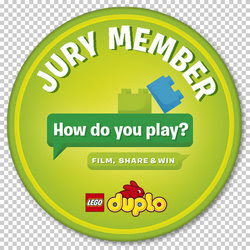 At £12.99 they're affordable to children who are saving up pocket money and really a bargain. 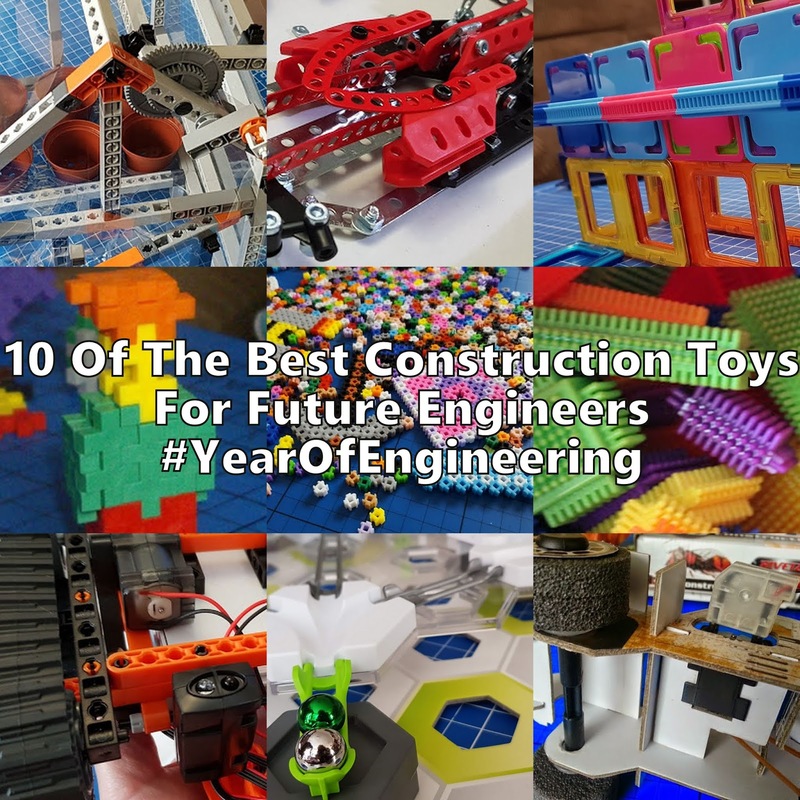 We're really impressed with the indestructible nature of these vehicles - a strong core with the main body of the vehicle attached and then braced makes for a LEGO vehicle you can really race. The next in the range is the McLaren Mercedes Pit Stop set 75911, including the MP4-29 Formula 1 Car - with a spare nose! 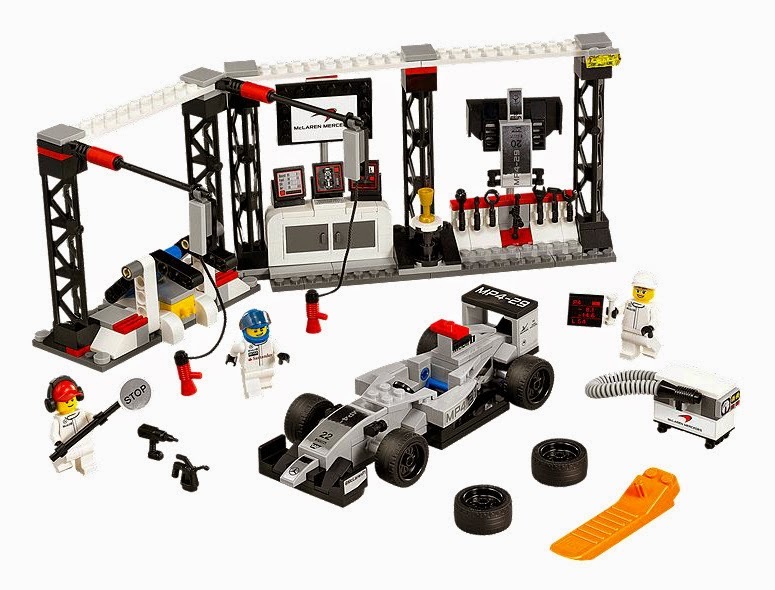 £29.99 for 332 pieces still makes for a good value set, and the play value is huge. 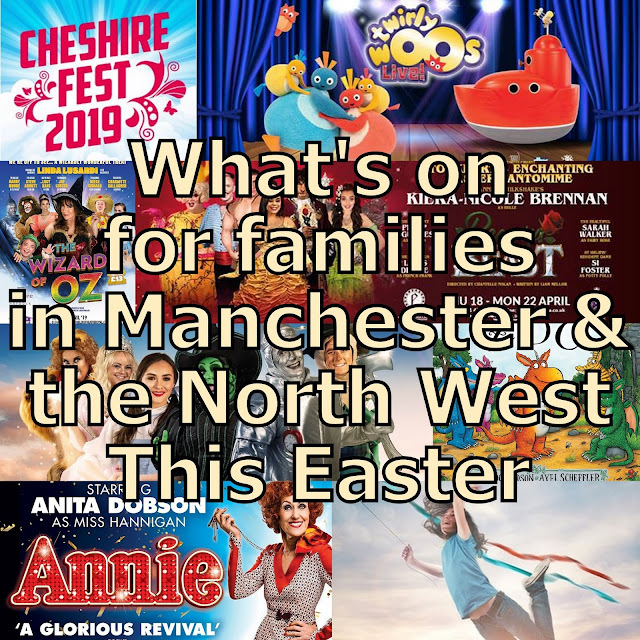 There is everything you need for a full modern pitstop, including some great details that will excite a child's imagination, and lots of tools and diagnostic equipment. 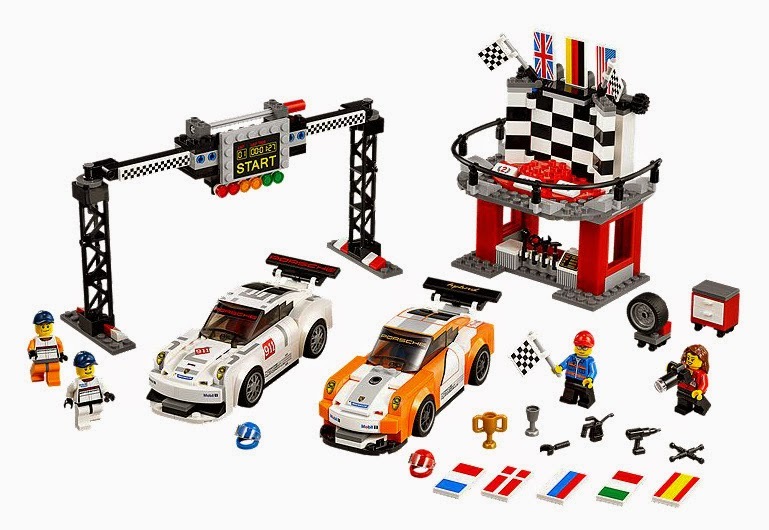 The Porsche 911 GT Finish Line Set 75912 is the next at £39.99 for a 551 piece set with 2 Porsche 911 GT cars, a 2in1 mini pit garage and podium with a flag that raises, and an overhead gantry finish line with dropping start lights. I love this set, it's excellent value for money. For 40 quid you've got an entire playset that a child can have many hours of fun with. The flags and tools always offer learning opportunities, and the inclusion of the 2 Porsche 911 vehicles means you can race without needing to build another car to match. The podium/garage is really well done and a lovely double use of the construction, and the start/finish line is spot on. Any one of my boys would absolutely adore this set. I haven't had a chance to play with it yet, but I'm hoping the cars are as sturdy as the 3 we've played with. 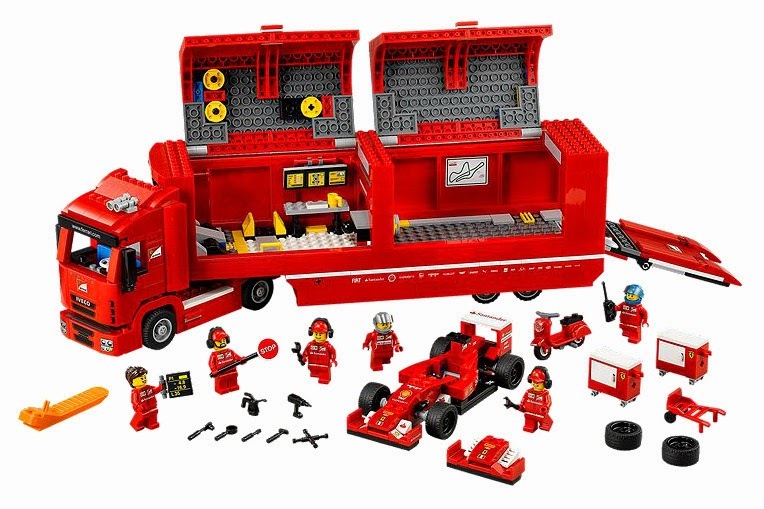 The largest set is the F14T and Scuderia Ferrari Truck at £79.99 for 884 pieces. The truck, the Ferrari F14T Formula 1 car and a multitude of tools and crew, including a spare nose and wheels. I love this set too, how can you not? The truck has all kinds of details and accessories, including a detachable trailer with opening side/roof, retractible ramp and computer screens. The Ferrari F14T Formula 1 car has a multitude of crew and accessories, including a spare nose and wheels. There's a Ferrari scooter, 2 rolling tool chests and the entire range of LEGO tools (probably). 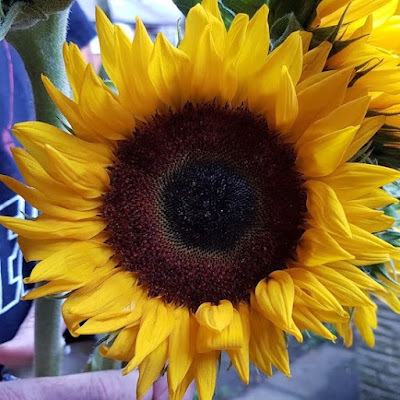 It's the stuff of dreams for many a small child (or older child). 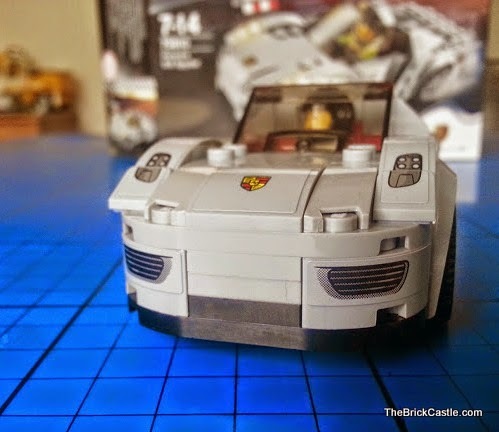 I expected the LEGO Speed Champions sets to be expensive, and potentially a bit flat. 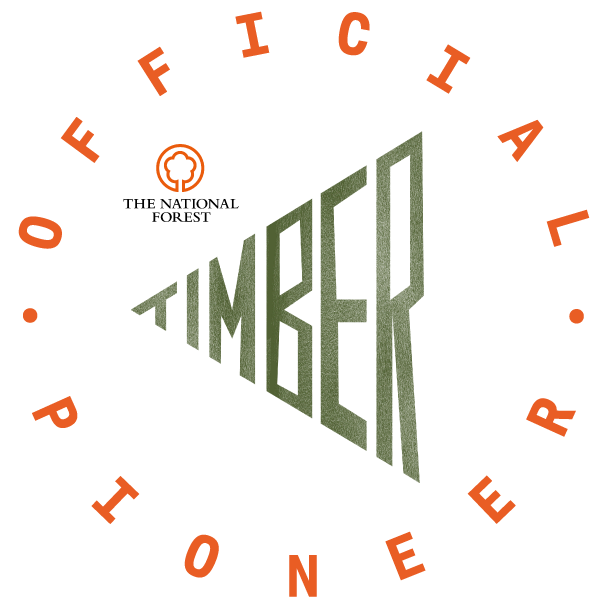 In fact I think they're stunningly good value and they offer a great deal for adult collectors and fans, and youngsters alike. All of the Speed Champions are recommended for 7-14, and that seems right to me because they're intricate and use a lot of small parts attached to other small parts (tricky for very young fingers), and the builds aren't instantly rewarding in the way that younger builders need - so that they don't become bored before they have something recognisable in their hand. 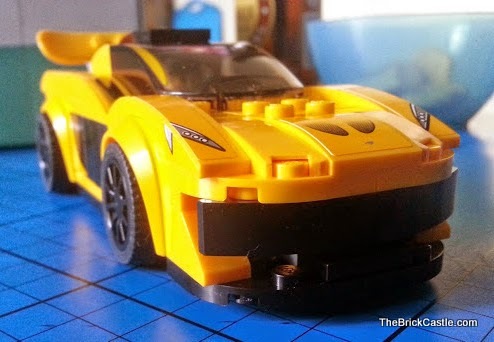 The cars are incredibly solid builds that have good weight in your hand and will not fall apart during play or transportation, and they look great. Ah Lego, you just can't beat it can you? I wonder how many men will get these cars for birthdays / father's day etc. Surely it can't be just me that does that to my other half?? I am wondering who would enjoy this more my 5 year old boy or my 43 year old husband! 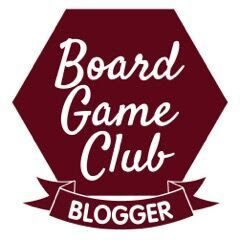 I am loving the look of these and you already know I want that Ferrari F1 set for my birthday! These cars look great and I love the Mercedes pit stop, so much play value to be had with it!